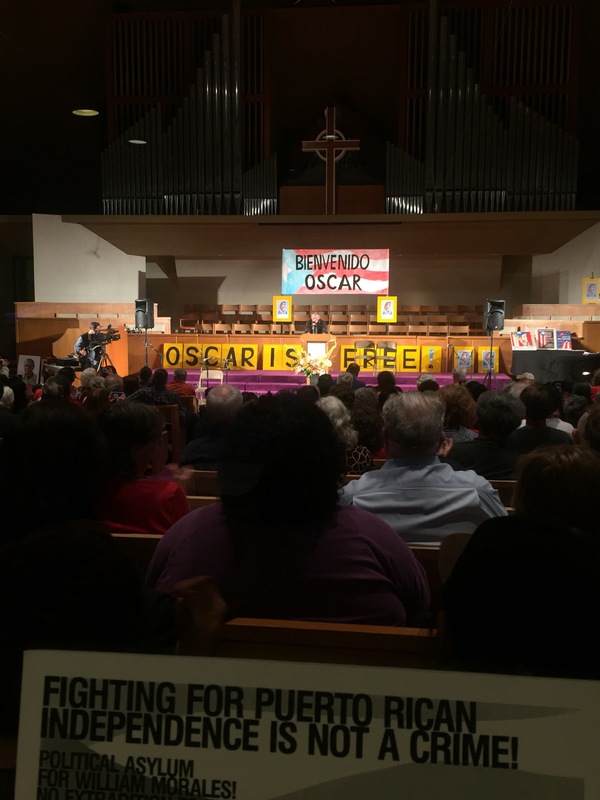 A Lifetime of Resistance: Bienvenído Oscar! and will die a Boricua. I picked up Oscar López Rivera: Between Torture and Resistance (Amazon | Indiebound) at a local event in Berkeley where I signed up as a security volunteer. Even though I didn’t know who OLR was, I was excited to be part of an event celebrating the release of a political prisoner. Apart from Angela Davis whose book inspired me, I don’t hear many stories of political prisoners being released. Maybe it was the timing, but I wanted to learn more about Oscar and his own struggle as a Puerto Rican independentista. As I write this, ten political prisoners were just released in the Philippines as part of ongoing peace talks between the NDF and the government. But more still languish behind bars. Many of the political prisoners released by the Philippine government are out of jail on certain conditions — as consultants for the peace talks. The event was rapidly filling up, as people walked in with the widest smiles. On the stage was a big “Bievenído Oscar!” banner. The reception hall was lined with artwork calling for Puerto Rican independence. The air had an electric feel to it and I’ve never seen so many activists in one space so joyous. Oscar was born in San Sebastián, Puerto Rico in 1943. At age 14, he moved to Chicago with his family and soon enough, he was drafted into the U.S. Armed Forces where he was awarded the Bronze Star for his service. But what came out of his time in Vietnam was not an increase in patriotic fervor, but a realization of who he was — Puerto Rican. As soon as he came back from the service, he started to organize his communities and push for an end to U.S. colonialism in Puerto Rico. From 1969 to 1976, Oscar helped found several programs and initiatives: the Pedro Albizu Campos High School, an alternative school for Puerto Ricans celebrating innovator Paulo Freire (who wrote Pedagogy of the Oppressed); the Puerto Rican Cultural Center; campaigns for bilingual education support; Project 500 at the University of Illinois, an educational initiative to ensure the annual admission of five hundred Latino and African American students; the Latin American and Latino studies, as well Proyecto Pa’lante; the Latin American Recruitment Education Services; the first Latino Cultural Center in the state of Illinois; the Spanish Coalition for Housing and many others. His civil activism between 1969 and 1976 clearly evidenced his genuine and significant effort to use every possible route of change within Chicago’s existing official structures. The question, however, remained: was it really possible to develop lasting (and not merely cosmetic) change within the prevailing dominant structures of U.S. society? To understand Alexander Von Humboldt, as told brilliantly by Andrea Wulf in The Invention of Nature: Alexander Von Humboldt’s New World (Amazon | Indiebound) is to see the natural world in relation to everything — philosophy, art, music, poetry, politics and most of all, ourselves. It was no surprise that I stumbled upon the book again, after hearing about it two years ago in a piece from The New Yorker. I walked into Book Tree in Oakland for the first time and there it was. I thought it was only fitting since it was Earth Day that day (April 22), a day to demonstrate environmental protection around the world. It wasn’t until after reading the book that I found out that Earth Day also falls around the birth anniversary of John Muir (April 21), the American naturalist and environmentalist greatly inspired by Humboldt. Since then, learning about Humboldt became a wild ride — his life was a rich tale of discovery, of curiosity, of connecting, of giving. I don’t think I’ve ever heard of a man whose sole purpose in life was to find out more about the natural world and weave it seamlessly with other disciplines. Humboldt wasn’t interested in classifying plants for the sake of research alone, nor was he scaling mountains and measuring height and altitude to make money with his discoveries. He was interested in making connections and seeing how every thing was interrelated.